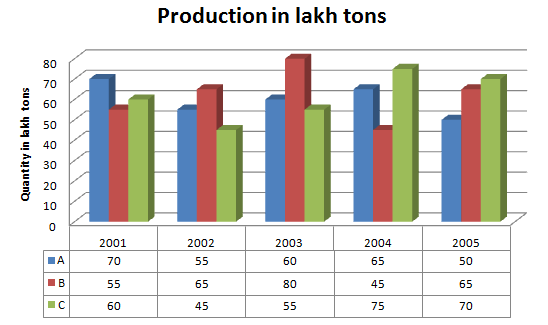 Directions Q 6- 10: The bar graph provided below gives the data of the production of paper (in lakh tonnes) by three different companies X, Y, Z over the years. Study the bar chart and answer the questions. 6). What is the difference between the production of Company A in 2004 and Company B in 2003? 7). What is the ratio of the average production of Company C in the period 2002 - 2005 to the average production of company A in the same period? 8). 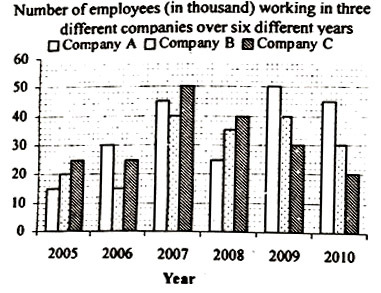 What is the percentage increase in the production of Company C from 2003 to 2005? 9). The average production for five years was maximum for which Company? 10). In which year the percentage of production of Company B to the production of company A is maximum? So company B has the maximum average. So for 2003 the percentage is highest.